The memorial tribute will be dedicated on Veterans Day at 2 p.m.
Miami University has a handful of memorials on campus, but until now none honored those who've served in the military. A tribute to alumni veterans and those who died while serving is being unveiled on Veterans Day at 2 p.m.
Navy veteran Dave Miller earned two degrees from Miami University in the 1960s, participating in the Navy ROTC while an undergraduate. He noted while Miami has tributes to many distinguished alumni, it lacked a monument honoring those who served in the military. Five years ago, he and another 1960s graduate, David Lawrence, set out to change that. 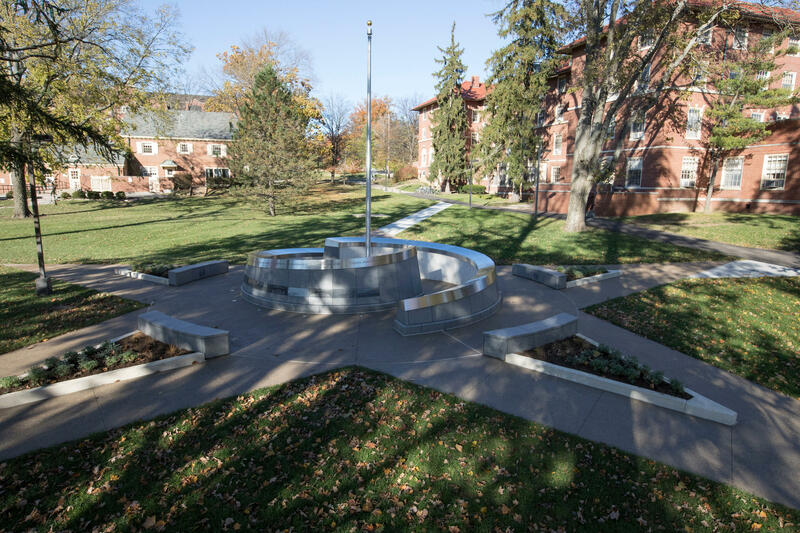 The Alumni Veterans Tribute Memorial aims to honor all alumni who served. "To have recognition made for any veteran who attended Miami, that's number one," Miller says. "But there's also a part of it that we can't forget about and that's the ... people who were either killed in action or [are] missing in action that were Miami grads also." Nearly 8,000 alumni have served and 279 are known to have been killed in action or are missing in action, according to the university. Initial designs by university architect emeritus Robert Keller were eventually turned over to architect Clete Benken with MKSK Studios. The tribute - Miller insists it's a tribute, not just a memorial - is comprised of two paired spirals made of granite, concrete and steel supporting a stainless cap inscribed with famous American documents like the Bill of Rights and the Declaration of Independence. Benken says the materials were carefully chosen. "Materials of strength, endurance and durability ... were selected to represent the ideals, the values, and the spirit of the veterans that have made the ultimate sacrifice." The names of alumni who were killed or went missing in action are carved into the granite spirals. "It's powerful in its simplicity," Benken says of the design. "All of the names that are inscribed on the wall are figuratively holding up all of the Constitutional documents and all of the tenets of our republic that are listed on them. The granite panels where the names are inscribed rest below and support the stainless steel cap that has all of those documents contained within it." Benken thinks visitors will find it especially moving at night when lights illuminate the granite upward toward the American flag, throwing the walls into silhouette from the column of light behind them. "As strong of an image as it is by day, it will be even more powerful at night," he says. The tribute has an online component as well: A website with a searchable database of names of all alumni and current students who are service members. Alumni can register themselves, and family members can add someone who is deceased. Funding for the project comes from private donations. Dave Miller likes that no corporate dollars are being used. "The idea there is that this would not be a commercially sponsored project," he says. "If you go to many other campuses around the United States that have a veterans tribute, they have major donors who were of a commercial nature. That is not the intent and never was the intent of this project. It was to be individually funded by families, current veterans, and families of veterans that have attended Miami University." Miller says Miamians have a long history of military service going back to the Civil War, when some students who had sat beside each other in class "marched off for the North and some marched down to the South." He points out Miami trained military members during World War II. "Miami trained many of the military personnel that could not be supplied by the service academies and services in general. The V-5 and V-12 groups ... went through training right on Miami's campus." A Miami History practicum compiled this list of personal narratives "Because Their Country Asked ..." about Miamians at war.